Hall of Famers: Cardinals: Tony La Russa (mgr.). The 2011 World Series was the 107th edition of Major League Baseball's championship series. The best-of-seven playoff was played between the American League champions Texas Rangers and the National League champions St. Louis Cardinals, with the Cardinals defeating the Rangers in seven games to win their 11th World Series championship and their first since 2006. The Series was noted for its back-and-forth Game 6, in which the Cardinals erased a two-run deficit in the bottom of the ninth inning, then did it again in the 10th. In both innings, the Rangers were one strike away from their first World Series championship. The Cardinals won the game in the 11th inning on a walk-off home run by David Freese. The Series was also known for the blowout Game 3, in which Cardinals player Albert Pujols hit three home runs, a World Series feat previously accomplished only by Reggie Jackson and Babe Ruth, and subsequently only by Pablo Sandoval (in 2012). The Series began on October 19, earlier than the previous season so that no games would be played in November. The Cardinals enjoyed home-field advantage for the series because the National League won the 2011 All-Star Game 5–1 on July 12. The 2011 World Series was the first World Series to go all seven games since 2002. The Rangers appeared in their second consecutive World Series; they lost the 2010 Series to the San Francisco Giants in five games. They were the first American League team to play in consecutive World Series since the New York Yankees did it from 1998 to 2001. They earned their postseason berth by winning the American League West division, and defeated the Tampa Bay Rays in the American League Division Series and the Detroit Tigers in the American League Championship Series to earn their World Series berth. The Cardinals appeared in their 18th World Series, and third in eight years. They lost to the Boston Red Sox in 2004, but won in 2006 against the Detroit Tigers. The Cardinals earned their postseason berth by winning the National League Wild Card on the last day of the regular season, and defeated the Philadelphia Phillies in the National League Division Series and the Milwaukee Brewers in the National League Championship Series to earn their World Series berth. This Series was only the second time the Rangers and the Cardinals played each other; they met in regular-season interleague play in 2004, where the Cardinals won two games of a three-game series in Texas. This was the first World Series assignment for umpires Greg Gibson and Ron Kulpa. Each of the other umpires had previously worked one World Series. The Cardinals were supported by fans brandishing Rally Squirrel memorabilia to celebrate their new impromptu mascot acquired during the playoff run which they credited with turning the Cardinals' fortunes around. This was the Rangers' second appearance in the World Series. Heading into 2010, their 50th season as a franchise (counting its time as the Washington Senators), the team was the only one in Major League Baseball to never win a postseason series, and was one of three teams (along with the Seattle Mariners and the Washington Nationals) to never appear in the World Series. However, that season, the Rangers won their first postseason series and made their first appearance in the World Series, only to lose to the San Francisco Giants in five games. During the offseason, Chuck Greenberg, who purchased the Rangers from Tom Hicks during the 2010 season along with Nolan Ryan, sold his interest in the team to Ryan, making him the Rangers' principal owner. Notable player departures during the offseason included pitcher Cliff Lee and outfielder/designated hitter Vladimir Guerrero (both to free agency) and catcher Bengie Molina, who retired. Notable free agent additions during the offseason included pitchers Yoshinori Tateyama and Brandon Webb, catcher Yorvit Torrealba, and third-baseman Adrián Beltré. In January 2011, as part of a three-way trade with the Toronto Blue Jays and Los Angeles Angels of Anaheim, the Rangers acquired catcher Mike Napoli in exchange for pitcher Frank Francisco. During the season, the team acquired pitcher Koji Uehara from the Baltimore Orioles in exchange for infielder Chris Davis, and Mike Adams from the San Diego Padres in exchange for two minor-league pitchers. Pitcher Arthur Rhodes was released and signed with the St. Louis Cardinals days later; as a result, Rhodes would have been entitled to receive a World Series ring regardless of which team won. With the exception of one day in late-April and a brief stretch in early-May, the Rangers led the American League West standings for most of the season. They finished the season with a franchise record 96–66 (.593 winning percentage) and won their second consecutive and fifth overall division title, 10 games ahead of the second-placers Los Angeles Angels of Anaheim. They also set a franchise for a home attendance record 2,946,949. Texas also earned the most shutouts in the American League. All five members of the opening day starting rotation stayed in the rotation for the entire year. C. J. Wilson tied for the league lead in starts with 34 while Derek Holland for second in shutouts with four, tied for first in the American League, and each pitcher had at least 13 wins. The offense also had another good year with three players getting 30-plus home runs for the first time in team history, and Ian Kinsler completed his second 30–30 season. The Rangers then defeated the Tampa Bay Rays by three games to one in the American League Division Series before beating the Detroit Tigers by four games to two in the American League Championship Series. The Rangers lost home-field advantage in the World Series as a result of the AL team, managed by Rangers manager Ron Washington, losing the 2011 All-Star Game, when the Ranger ace C. J. Wilson surrendered the game-winning three-run homer to Prince Fielder. The Cardinals made their first World Series appearance since 2006, when they defeated the Detroit Tigers four games to one to win their National League-leading 10th World Series title. This was manager Tony La Russa's sixth World Series appearance as manager and his third with the Cardinals. The Cardinals' last postseason appearance was in 2009, where they were swept by the Los Angeles Dodgers in the National League Division Series. They finished the 2010 season with a record of 86–76 (.531), finishing in second-place in the National League Central standings, five games behind the Cincinnati Reds. During the 2010 offseason, the team signed new contracts with manager Tony La Russa and picked up all-star slugger Albert Pujols' club option. Notable offseason departures included shortstop Brendan Ryan (traded to the Seattle Mariners) and relief pitcher Blake Hawksworth (traded to the Los Angeles Dodgers). Additionally, during the offseason the team announced that ace pitcher Adam Wainwright would miss the entire season due to Tommy John surgery. Notable offseason additions included shortstop Ryan Theriot, outfielder Lance Berkman, catcher Gerald Laird, and infielder Nick Punto. In late April after a number of blown saves, the Cardinals removed pitcher Ryan Franklin from the closer role, and released him on June 29. On July 27, the Cardinals sent outfielder Colby Rasmus and pitchers Trever Miller, Brian Tallet, and P. J. Walters to the Toronto Blue Jays in exchange for pitchers Edwin Jackson, Marc Rzepczynski, and Octavio Dotel, and outfielder Corey Patterson. They then acquired Rafael Furcal from the Dodgers in exchange for Alex Castellanos, a minor-league outfielder. On August 11, the team signed free agent pitcher Arthur Rhodes, who had been released by the Texas Rangers days earlier. The Cardinals spent much of the early part of the 2011 season in first-place in the NL Central standings but dropped to second-place for good on July 27. On August 25, the team trailed the Atlanta Braves in the NL wild card standings by 10 1⁄2 games. The Cardinals amassed a 21–9 record from August 26 to September 27, while the Braves were 10–19 over that same interval. Meanwhile, on September 23, the Milwaukee Brewers clinched the NL Central division title. On September 28, with the Cardinals and Braves tied atop the Wild Card standings on the last day of the regular season, the Cardinals routed the Houston Astros 8–0 in Houston, while the Braves lost at home to the Philadelphia Phillies 4–3 in 13 innings, securing the Cardinals' second wild card postseason berth in franchise history. St. Louis finished with a record of 90–72, six games behind the Brewers in the NL Central but one ahead of the Braves in the Wild Card. They defeated the Phillies in the National League Division Series three games to two, and then defeated the Brewers in the National League Championship Series four games to two. Aces were on the mound for Game 1 as C. J. Wilson faced Chris Carpenter. Both starters kept the game scoreless through the first three innings. In the fourth, Albert Pujols was hit by a pitch to lead off the inning. After a double by Matt Holliday, Lance Berkman hit a single to drive both runners in. The lead wouldn't last long. Mike Napoli hit a two-run home run to tie the game in the very next inning. David Freese doubled in the sixth with one out, and moved to third on a wild pitch. After Yadier Molina struck out, and Nick Punto walked, Allen Craig entered the game, pinch-hitting for Carpenter. Alexi Ogando relieved Wilson, and tried to finish off the inning. Craig hit a 1–2 pitch down the right field line that was just out of reach of a sliding Nelson Cruz. Freese scored to give St. Louis the lead. In the seventh, the Cardinals ran into trouble as Cruz singled and Napoli walked to put two on with one out. Marc Rzepczynski came on to face pinch-hitter Craig Gentry and struck him out. Pinch-hitter Esteban Germán was the next batter. Rzepczynski struck him out as well. In the ninth, closer Jason Motte pitched an easy 1–2–3 inning to give St. Louis the win. Controversy surrounded the inning, as Adrián Beltré was the victim of a blown call. Beltré grounded a ball to third, and Descalso threw the ball to first for the out, but replays showed he fouled the ball off his foot. Game 2 saw a pitchers' duel between Jaime García and Colby Lewis. Both starters kept the game scoreless through the first six innings. A pair of excellent defensive plays by Elvis Andrus stopped a couple of Cardinals rallies. In the seventh, David Freese again started a rally for St. Louis, much like in Game 1. He singled with one out, and moved to third on a single by Nick Punto with two outs. Allen Craig pinch-hit for García to face Alexi Ogando, setting up almost the same exact situation from the previous night. Again, Craig beat Ogando with a single to right field to drive in Freese. Jason Motte was brought in to save the game in the ninth. Ian Kinsler led off with a bloop single, and stole second with Andrus batting. Andrus singled into center field, and moved to second on the throw home, which got by Albert Pujols for an error. With runners on second and third, and none out, Tony La Russa switched in Arthur Rhodes for Motte. Consecutive sacrifice flies from Josh Hamilton and Michael Young gave Texas the lead. Neftalí Feliz came on in the ninth, and allowed a leadoff walk to Yadier Molina, but retired the next three batters in order to end the game and tie the Series at one game apiece. After a total of just eight runs scored in the first two games in St. Louis, the offense of the two lineups scored a combined 23 runs on a historic night in Arlington in which Albert Pujols had what was described as "the greatest individual hitting performance in World Series history". Allen Craig hit a home run in the first to put the Cardinals up 1–0. They scored four more runs in the fourth after a controversial call at first base by umpire Ron Kulpa and a run-producing error by Mike Napoli, but the Rangers came back in the bottom frame: Michael Young and Nelson Cruz hit home runs to make it 5–3. But in the next inning the Cardinals added three more runs including what became the game-winning two-RBI double by Yadier Molina making the score 8–3. The Rangers answered with three runs in the bottom half of the inning to make it a two-run game again. Albert Pujols, who had been hitless through the first two games, then hit a 423 ft (129 m) home run off Alexi Ogando in the sixth inning to drive in three runs. He homered two more times later and drove in six runs in total on the night. The Cardinals went on to win the game by a score of 16–7, leading the Series by 2–1. Albert Pujols joined Babe Ruth (1926, 1928) and Reggie Jackson (1977) as the only players in baseball history up to that time to hit three home runs in a World Series game. (Pablo Sandoval would also accomplish the feat the following year.) Pujols was 5-for-6 with two singles, three HRs, four runs scored, and six RBIs. Yadier Molina added two doubles, driving in four runs. David Freese continued his postseason 13-game hitting streak getting two hits (one double), driving in two runs. Pujols became the first player in World Series history to get hits in four consecutive innings: fourth (single), fifth (single), sixth (HR, three RBIs), and seventh (HR, two RBIs). He tied records for most HRs (3), most hits (5), and most RBIs (6) in a World Series game, and established a new record with 14 total bases. The 16 runs scored by the Cardinals were the most runs scored in a World Series game since 2002, when the San Francisco Giants scored 16 against the Anaheim Angels. The current record is 18 by the New York Yankees against the New York Giants in 1936. After a high scoring affair the night before, Derek Holland quieted the Cardinals' bats as he pitched 8 1⁄3 innings of two-hit baseball. Lance Berkman had both of the Cardinals' two hits. Josh Hamilton's first-inning RBI double put the Rangers in front for only the second time in the Series. A three-run home run by Mike Napoli provided Holland a comfortable 4–0 lead. The Cardinals managed a small rally in the ninth, but were unable to score against closer Neftalí Feliz. Coincidentally, this game was only one of two major DFW vs. St. Louis sporting events taking place in Arlington on that day, as the NFL's Dallas Cowboys and St. Louis Rams had played at nearby Cowboys Stadium that afternoon; during the opening coin toss, Berkman and Hamilton, in uniform, had each served as honorary captains for their city's team. Game 1 starters C. J. Wilson and Chris Carpenter faced off again. Wilson walked two batters, Matt Holliday and Lance Berkman, in the second inning and both came in to score, aided in part by an error by David Murphy. However, despite the Rangers walking nine batters in the game (including Albert Pujols three times intentionally), the Cardinals had not scored again, leaving twelve runners on base. Mitch Moreland hit a solo home run in the third, and Adrián Beltré also hit one in the sixth, to tie the score at 2–2. The Rangers' half of the eighth featured a series of bullpen mix-ups by the Cardinals, leaving Tony La Russa without closer Jason Motte in a crucial situation. After Michael Young led off the inning with a double, La Russa sent both Motte (a right-hander) and left-handed reliever Marc Rzepczynski to begin warmups. However, Cardinals bullpen coach Derek Lilliquist later stated that he only heard Rzepczynski's name called. When La Russa saw that Motte was not warming up, he made a second call to the bullpen, but this time Lilliquist thought he heard La Russa called for reliever Lance Lynn, who was supposedly unavailable for the game due to throwing 47 pitches in Game 3. Dotel intentionally walked Nelson Cruz, whereupon La Russa summoned Rzepczynski to face the left-handed hitting Murphy. Usually, the Rangers would counter with a right-handed pinch-hitter, such as Craig Gentry or Yorvit Torrealba. However, Murphy stayed in the game, and hit a grounder off Rzepczynski, loading the bases. With Motte not yet available (La Russa thought he was warming up, but he was not yet ready), La Russa was forced to match Rzepczynski against the right-handed hitting Mike Napoli, who hit a two-run double scoring Young and Cruz. After a Moreland strikeout, La Russa summoned for Motte from the bullpen, only to be surprised to see Lynn coming out (it was then when he learned of the mix-ups). Lynn then was asked to intentionally walk Ian Kinsler, making him only the third pitcher in World Series history to make a relief appearance solely to serve an intentional walk. Neftalí Feliz came in to save the game in the ninth, his second save of the Series. Game 6 is considered to be one of the greatest World Series games in history. Game 6, moved from October 26 to 27 due to rain, was a rematch of Game 2's starters: Cardinals lefty Jaime García and Rangers starter Colby Lewis. Texas jumped on top immediately, with Josh Hamilton driving in Ian Kinsler in the top of the first. The Cardinals responded quickly with a two-run Lance Berkman home run in the bottom half. Kinsler tied the game in the top of the second with a ground-rule double, scoring Craig Gentry. García was pulled after only three innings (and 59 pitches) and replaced with Fernando Salas. Leading off the top of the fourth, Matt Holliday misplayed a Nelson Cruz pop fly, putting Cruz at second. Mike Napoli singled him home to once again give Texas the lead. The Cardinals jumped right back in the game, taking advantage of a Michael Young error and scoring on a Yadier Molina groundout to knot the game at three. David Freese started off the top of the fifth by dropping a routine pop fly (the third consecutive half-inning to begin with an error), which immediately turned into the go-ahead run for Texas on Young's double. Colby Lewis was cruising for the Rangers until the bottom of the sixth. After an Albert Pujols strikeout, Berkman singled to third. Matt Holliday grounded into a possible double play which was mishandled at first by Michael Young (his second error of the game), leaving all runners safe. Lewis walked the bases loaded and was pulled for Alexi Ogando, who promptly walked Yadier Molina to force in a run. With the Cardinals in a prime position to rally ahead, Matt Holliday, standing 90 feet (27 m) away as the possible go-ahead run, was picked off at third by catcher Mike Napoli. Holliday injured his finger sliding in on the play and was forced to leave the game. The Rangers were able to slip out of the inning with the score still tied. Lance Lynn came on to pitch for the Cardinals in the top of the seventh and was promptly greeted with back-to-back home runs by Adrián Beltré and Nelson Cruz to put Texas up by two. Ian Kinsler added his second RBI later in the inning to make the score 7–4 Rangers. In the bottom of the eighth, Allen Craig (who entered the game as Holliday's replacement) hit a solo home run to pull the Cardinals within two. Rangers closer Neftalí Feliz entered in the bottom of the ninth to deliver the Rangers their first ever World Series Championship. After striking out Ryan Theriot, Feliz faced Albert Pujols. Facing possibly his last at-bat as a Cardinal, Pujols hit Feliz's first pitch into left field for a double. Feliz walked Lance Berkman to put the tying run on first, but got Craig to take a called third strike. The Rangers were one out away from a championship as David Freese stepped to the plate. Down in the count 1–2 and down to the last strike, Freese hit Feliz's pitch past a leaping Nelson Cruz off the wall for a triple, tying the game at seven in dramatic fashion. Sent into extra innings, Jason Motte went out for his second inning of work. Elvis Andrus singled, then the Rangers' MVP candidate Josh Hamilton put Texas up again with a towering two-run home run. Down 9–7, and out of bench players, the Cardinals once again faced only three outs until elimination. Left-hander Darren Oliver came in to pitch for the Rangers. St. Louis Players Daniel Descalso and Jon Jay got back-to-back singles, and starting pitcher Kyle Lohse was called to bunt. Lohse's sacrifice bunt put the tying run in scoring position. With right-handers coming up, right-hander Scott Feldman replaced Oliver on the mound. Ryan Theriot grounded out, scoring Descalso, and following an intentional walk to Pujols, Berkman stepped up to the plate. Feldmen got ahead on the count 1-2. Berkman worked the count to 2–2, and again the Rangers were one strike away from their first championship. Berkman took Scott Feldman's next pitch into center field for a single, scoring Jon Jay and tying the game once again. It was the first time in World Series history that a team came back from two different two-run deficits in the ninth inning or later in the same game. The Rangers failed to score in the top of the 11th, bringing David Freese to lead off the bottom of the inning. Freese hit Mark Lowe's 3–2 pitch into the center field grass for a game-winning home run, forcing the World Series to a Game 7 for the first time since 2002. Of the last 13 instances in which a Major League team won a Game 6 at home to force a Game 7 in the postseason, all but two went on to win Game 7. The exceptions were the New York Mets in the 2006 NLCS against, coincidentally, the Cardinals; and the Boston Red Sox in the 1975 World Series against the Cincinnati Reds. Freese's walk-off home run was the fourth that won in a Game 6 in World Series history. The Cardinals set two World Series milestones in their Game 6 win—the first team to come back from deficits in both the 9th and 10th innings, and the first team to score in the 8th, 9th, 10th, and 11th innings. On Mike and Mike in the Morning the next day, ESPN senior baseball analyst Buster Olney called it the greatest game in the history of baseball. Game 6 was originally scheduled for Wednesday, October 26, but was postponed due to heavy rain in the forecast. Although rain was only falling fairly lightly in St. Louis when this decision was made, MLB officials did not want a repeat of Game 5 of the 2008 World Series, which was suspended after the top of the sixth inning and resumed two days later. David Freese and Lance Berkman became the third and fourth players in World Series history to get game-tying hits with their team one out from elimination. Freese, who grew up a Cardinal fan in the suburbs of St. Louis, said that as he was circling the bases after his home run, he was thinking about a similar walk-off homer by Jim Edmonds for the Cardinals in Game 6 of the 2004 National League Championship Series. After Freese said he remembered that home run, Lance Berkman, who played for the losing Houston Astros in that series, said "So do I." Busch Stadium scoreboard after Game 7. Cardinals players celebrate after winning their franchise's 11th World Series title. Before Game 7, the Cardinals replaced Matt Holliday, who sprained his wrist in Game 6, on their roster with Adron Chambers. Josh Hamilton and Michael Young had RBI doubles in the first inning against Chris Carpenter, who became the first pitcher in a decade to make three starts in one Series. David Freese had a game-tying two-run double in the bottom of the first, breaking the post-season RBI record, and Allen Craig hit a go-ahead homer in the third. Craig even robbed a home run from Nelson Cruz in the sixth. St. Louis added two runs off Scott Feldman in the fifth inning without getting a hit. Yadier Molina walked with the bases loaded, C. J. Wilson came on to relieve Feldman and promptly hit Rafael Furcal with his first pitch, forcing in another run to make it 5–2. In the seventh inning, Lance Berkman scored on a Molina single to make it 6–2. Chris Carpenter was relieved after pitching six innings and was credited with the win. The Cardinals used four relievers to hold Texas scoreless over the final three innings. The final out was recorded when Jason Motte got David Murphy to fly out to Cardinal left fielder Allen Craig as Busch Stadium went into a frenzy. David Freese became the sixth player in history to earn a League Championship Series and World Series MVP award in the same postseason. The Rangers set a Series record by issuing 41 walks, breaking the previous record held by the Florida Marlins when winning the 1997 World Series after issuing 40. The Cardinals became the first wild card team to win the World Series since the Boston Red Sox won the 2004 World Series (coincidentally, against the Cardinals). The series was televised in the United States and Canada by Fox. Joe Buck called play-by-play on his 14th World Series for the network, dating back to 1996, while color analyst Tim McCarver handled his 22nd World Series since 1985. Ken Rosenthal served as field reporter for the games, while Chris Rose hosted the pregame and postgame coverage with analysts A. J. Pierzynski and Eric Karros. Joe Buck's call of ... we will see you tomorrow night!" on David Freese's walk-off home run echoed his father Jack's call from Game 6 of the 1991 World Series, occurring 20 years and a day apart from each other, given the similar situations: Game 6, first batter of the final inning, and breaking a 3-3 tie to win the game 4-3, and extend the series to a 7th game. MLB International syndicated television coverage of the Series (with Gary Thorne and Rick Sutcliffe announcing) to viewers outside of North America. The ratings started off poorly, averaging just 8.4 through its first 5 games (at this time, the record for lowest World Series rating was 8.4, set by the 5 games 2008 World Series and the 5 games 2010 World Series). Game 3 also produced a 6.6 rating, making it the second lowest World Series rated game of all-time (behind the 6.1 rating in Game 3 of the 2008 World Series and Game 3 of the 2012 World Series). However, Games 6 and 7 generated massive ratings that brought the overall average to 9.9. The 14.7 rating for Game 7 is the network's highest for a World Series telecast since Game 4 of the 2004 World Series. ESPN Radio also broadcast the games nationally. This was the first World Series for play-by play announcer Dan Shulman and analysts Orel Hershiser and Bobby Valentine. ESPN Deportes Radio aired the Series for Spanish language listeners, with Ernesto Jerez and Guillermo Celis announcing. Locally, the two teams' flagship stations broadcast the Series with their respective announcing crews. The Rangers' broadcasts aired on KESN-FM (with Eric Nadel and Steve Busby announcing), while the Cardinals' broadcasts aired on KMOX (with Mike Shannon and John Rooney announcing). Due to contractual obligations, the non-flagship stations on the teams' radio networks carried the ESPN Radio broadcasts of the games, although the local broadcasts were available on XM Satellite Radio and to Gameday Audio subscribers at MLB.com. In the United Kingdom, Simon Brotherton and Josh Chetwynd called the games for BBC Radio 5 Live Sports Extra. La Russa during the World Series parade. The 2011 World Series was only the second World Series ever in which a team, one strike away from elimination, came back to win—with the Cardinals, in fact, achieving this feat twice in Game 6. The first was the 1986 World Series, in which the New York Mets rallied from a 5–3 deficit in the bottom of the 10th inning of Game 6 to win the game and, later, the decisive Game 7. This was the third and final World Series title for Cardinals manager Tony La Russa, who announced his retirement on October 31, 2011, after 33 seasons as a major league manager. La Russa had previously led the Cardinals (2006) and Oakland Athletics (1989) to World Series championships. Former Cardinals catcher Mike Matheny, who played for the 2004 Cardinals that lost the World Series, was hired to replace him. After the New York Giants won Super Bowl XLVI during the offseason, some news organizations, among them The St. Louis Post-Dispatch, compared the Cardinals to the Giants, invoking Al Michaels's call of the Giants winning the Super Bowl: "The New York Giants, given the last rites by many in December, are the Super Bowl Champs in February." The Rangers became the first team to lose in the World Series in consecutive years since the Atlanta Braves in 1991 and 1992 and the first American League team to do so since the New York Yankees in 1963 and 1964. Albert Pujols and C. J. Wilson would later end up signing with the Los Angeles Angels of Anaheim in the offseason, in one of the deepest free-agent classes in recent MLB history, while the Rangers obtained the rights to sign Japanese star pitcher Yu Darvish to replace Wilson. In his first press conference as a Ranger, Darvish was asked about Game 6 of the World Series where David Freese hit walk-off home run in the bottom of the 11th, and said "If it was last year , I would have given up a home run and lost the game. This year  I won't let that happen." Both teams would advance again into the postseason in the following year, both as wild cards entrants. The Rangers lost to the Baltimore Orioles in the inaugural American League Wild Card game, and would not make the post season again until 2015. The Cardinals won the inaugural National League Wild Card game against Atlanta before displaying more comeback magic in defeating the Washington Nationals in the NLDS in five games. After having a 3–1 series lead against the San Francisco Giants in the NLCS, the Cardinals fell one game short of a return trip to the World Series in losing each of the final three games to end the season. St. Louis would return to the World Series in 2013, continuing the pattern of Giants and Cardinals exchanging pennant victories. However, the Cardinals lost to the Boston Red Sox in six games despite leading 2–1. La Russa would be inducted into the National Baseball Hall of Fame in 2014. ↑ "2011 World Series". Baseball-Reference. Retrieved January 6, 2014. ↑ "Nelson Cruz sets home run record as Rangers return to Series". ESPN. October 15, 2011. Retrieved October 17, 2011. ↑ "Cardinals outslug Brewers to cruise into World Series". ESPN. October 16, 2011. Retrieved October 17, 2011. 1 2 Gilbert, Steve (July 13, 2011). "Royal blast: Prince's homer lifts NL past AL". MLB.com. Retrieved October 18, 2011. ↑ Hawkins, Stephen (October 16, 2011). "Texas right back in World Series with 2nd AL title". Yahoo! Sports. Associated Press. Retrieved October 16, 2011. ↑ Fly, Colin (October 17, 2011). "Pujols, Cardinals take wild ride to World Series". Yahoo! Sports. Associated Press. Retrieved October 17, 2011. 1 2 "Rangers-Cardinals: A Capsule Look". Boston Globe. Associated Press. October 17, 2011. Retrieved October 17, 2011. ↑ Umpire Ejection Fantasy League (October 18, 2011). "Roster: 2011 World Series Umpires". Retrieved October 18, 2011. ↑ Sullivan, T. R. (March 11, 2010). "Greenberg leaves Rangers; Ryan named CEO". MLB.com. Retrieved October 28, 2011. ↑ Henson, Steve (October 18, 2011). "Rhodes gets a World Series ring, win or lose". Yahoo! Sports. Retrieved October 18, 2011. ↑ DiComo, Anthony (October 18, 2011). "Finally in World Series, Rhodes guaranteed ring". MLB.com. Retrieved October 19, 2011. ↑ "Texas Rangers Attendance, Stadiums, and Park Factors". Baseball-Reference.com. Retrieved October 17, 2011. 1 2 Bloom, Barry M. (October 26, 2011). "Weather forecast postpones Game 6 of Series: Rangers-Cards to resume play Thursday night at Busch Stadium". MLB.com. Retrieved October 26, 2011. ↑ Leach, Matthew (October 23, 2011). "Mr. Octo'bert: Pujols' 3 HRs answer critics". MLB.com. Retrieved October 23, 2011. ↑ "St. Louis at Texas". USA Today. October 23, 2011. Retrieved October 23, 2011. ↑ Strauss, Joe (October 22, 2011). "Pujols hits three homers; Cards win 16–7". St. Louis Post-Dispatch. Retrieved October 23, 2011. ↑ "Holland Tops Pujols, Cards as Texas Ties Series". Fox News Channel. Associated Press. October 23, 2011. Retrieved October 29, 2011. ↑ "Berkman, Hamilton at coin toss". St. Louis Cardinals. 1 2 Langosch, Jenifer (October 25, 2011). "Tony calls bullpen, gets wrong numbers". MLB.com. Retrieved October 25, 2011. ↑ Leach, Matthew (October 28, 2011). "Drama king: Freese sends Cards to Game 7: Third baseman ties game in ninth, wins it in 11th with walk-off HR". MLB.com. Retrieved October 28, 2011. ↑ Cassavell, AJ; Merkin, Scott (October 28, 2011). "Spellbinding Game 6 leaves pundits stunned: Commentators, analysts universally amazed by Cards' triumph". MLB.com. Retrieved October 28, 2011. ↑ Castrovince, Anthony (October 28, 2011). "Epic ending to Game 6 a fitting prelude". MLB.com. Retrieved October 28, 2011. ↑ DiComo, Anthony (October 28, 2011). "'Unbelievable' Game 6 ranks among best: Players on both sides struggle to find precedent for classic". MLB.com. Retrieved October 28, 2011. ↑ "ESPN Radio Dallas". ESPN. October 28, 2011. Retrieved October 28, 2011. ↑ The others were Otis Nixon in 1992 and Josh Devore in 1911. ↑ Schoenfield, David (October 28, 2011). "Pain, agony: Cardinals win all-time thriller". ESPN. Retrieved April 3, 2012. ↑ Borzi, Pat (October 28, 2011). "Berkman hits in the clutch, and at the microphone". New York Times. Retrieved April 3, 2012. ↑ Goold, Derrick (October 28, 2011). "Holliday replaced on roster; Carpenter starts Game 7". St. Louis Post-Dispatch. Retrieved October 28, 2011. ↑ Walker, Ben (October 28, 2011). "Craig HR, Freese 2B give Cards 5–2 lead in Game 7". Houston Chronicle. Retrieved October 29, 2011. ↑ "Final Playoff Series: Game 7 of 7". ESPN. Retrieved October 29, 2011. ↑ "Game 7 Play by Play". ESPN. Retrieved October 29, 2011. ↑ Mitchener, Mark. "World Series 2011: Cardinals beat Rangers in finale". BBC. Retrieved October 29, 2011. ↑ DiComo, Anthony (October 29, 2011). "Freese caps stellar playoffs with Series MVP". MLB.com. Retrieved October 29, 2011. ↑ Seidman, Robert (October 18, 2011). 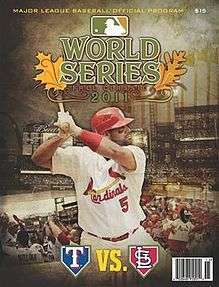 "2011 World Series TV Schedule: Cardinals & Rangers Battle for the World Series Crown on Fox". TV by the Numbers. ↑ "The World Series Is Truly Global With An International Audience". Fang's Bites. October 27, 2011. ↑ "ESPN's Baseball Tonight & ESPN Radio All Over The 107th Fall Classic". Fang's Bites. October 18, 2011. ↑ Horn, Barry (October 28, 2011). "Eric Nadel does his best not to jinx Rangers, but Game 6 collapse couldn't be avoided". Dallas Morning News. ↑ "World Series Schedule Released". CBS St. Louis. October 17, 2011. ↑ Smith, Matt (October 19, 2011). "World Series 2011 preview". Baseball GB. ↑ Verducci, Tom (November 7, 2011). "Go Crazy, Baseball, Go Crazy". Sports Illustrated. 115 (18). ↑ New York was also down to their last strike on two occasions, although one of them was short-lived, as a wild pitch brought in a tying run before the at-bat ended. ↑ Nowak, Joey (October 31, 2011). "La Russa announces his retirement as skipper". MLB.com. Retrieved October 31, 2011. ↑ Miklasz, Bernie (February 5, 2012). "Giants look good, but Pats have the goods". St. Louis Post-Dispatch. p. C1. The Giants seemingly are the NFL's version of the 2011 St. Louis Cardinals: a rather ordinary team, prematurely counted out, only to launch an improbable and magical comeback to a world championship. ↑ Sullivan, T.R. (January 20, 2012). "Yu mania makes debut at Rangers Ballpark". MLB.com. Retrieved July 6, 2012. ↑ "Tony La Russa". National Baseball Hall of Fame. Wikimedia Commons has media related to 2011 World Series.